Feng Shui can help to create excellent and productive energy in all your surroundings. Your backyard is an extension of your home. Therefore it is essential to apply Feng Shui practices in your garden, as well as in your home. It doesn’t matter how big or small your backyard is. The important thing is to do the most with the space you have and create a beautiful and well-planned place to relax. A well-planned garden will bring good energy to your home, attract nourishing and be a delight to you. The main tool to use in creating your Feng Shui garden is Bagua – the Feng Shui energy map that shows which areas of your home or backyard are connected with your life. This map consists of 8 areas that are the most important in everyone’s life – health, money, love and family, creativity, people in one’s life, career, spiritual growth, and fame. Therefore placing the right elements in the right places will improve the energy flow to these important areas. The first thing to do, to use the Bagua, is a proper compass read of your backyard – to correctly apply the five elements of Feng Shui – Earth, Fire, Metal, Wood, and Water. The geographic directions and their corresponding elements and uses are. Applying these elements to the certain areas of your garden will help the energy flow through these areas of your life, therefore improving your wellbeing. Also, make sure not only to apply the correct elements but also use the colors of each Feng Shui element. Once you’ve figured out the right directions, you can start placing garden elements and plants. A good Feng Shui garden shouldn’t be overloaded – remember to let the energy flow freely. The garden must be open, filled with natural light and brightness and invite nature and elements to help the energy move. Take a look at your existing backyard – paying respect to nature is also crucial for the flow of energy. If you already have natural plants and trees growing in your garden, you might want to keep some, if not all of them. Make sure that trees are not overgrowing or touching your house. The essential plants in your garden which can increase the great energy when placed in the right areas are. The next important feature is to allow the good energy – Chi – to flow freely through your garden. That means using natural, free-flowing shapes in your backyard. This will make you and your loved ones to want to linger in the garden. If you have empty walls in your backyard, feel free to use paintings and canvas. You can improve certain areas of your life by using the right colors, for example, use a painting with a lot of red and pink elements to attract love, boost your relationship and gain more self-esteem. One of the most popular Feng Shui backyard elements is water. Water, in general, represents the good energy and promotes the flow of Chi. The water element is most beneficial in East, Southeast and North areas- so you can use this element in one, or all of these areas. Be sure to use the right shape of your water element too – either it’s a natural pond, or a made one, or a fountain. For fountains, pick the shape, color and material according to the geographical spot you want to place it. Also, it is better, if the water is flowing in the direction of your house – bringing wealth and abundance. Another good element is wind chimes – bring more delight to your senses. 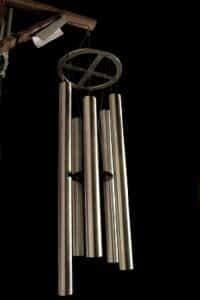 Wind chimes traditionally are used to cure negative energies. The most important thing to pay attention when purchasing wind chimes is material, symbols, and numbers. Depending on the area you want to place your wind chimes, you can mindfully choose the right material – an active metal element for West, Northwest, and North, Bamboo for East, Southeast, and South. Also, you can find wind chimes made of crystals, porcelain, and clay –in case you need a strong element in your Earth area. Some of the wind chimes already come with traditional Chinese symbols, so before purchasing it, you should find out what these symbols mean, for example- protection, love, enlightenment. The number of bells is important to increase or decrease energy – the number 5 will suppress bad energy, but 6 and eight bells will increase beneficial energy. Another great and functional element for your backyard is garden lights. Bring the warm energy of fire in your life. Make sure to bring light to all your garden areas- don’t leave any corner dark. You can choose from so many shapes, colors and materials – decide on what areas you want to strengthen in your life and use the fire element and its shape for it. Also, garden lights can be used as a significant element of symbolism, for example, a symbol of good luck, wealth and prosperity are turtles, dogs, dragons, and frogs. A genuinely relaxing backyard needs a place to rest. Depending on the size of your garden and Bagua areas you want to strengthen, you can place more a few chairs and seats in your garden. It’s not right to put benches in open spaces. They should be surrounded by plants. Always keep your furniture, and other garden elements well maintained – broken furniture attracts sickness. For example, you can place wooden benches in South, East or Southeast; metallic ones in West or Northwest. Not only your garden should be placed for you to rest, but also for natures creations – placing a birdbath or feeder is a great option. It can also be used as a water element, in the meantime inviting nature and promoting the energy flow. The center of your garden is the Tai Chi zone – the element here is the earth with its yellow color. 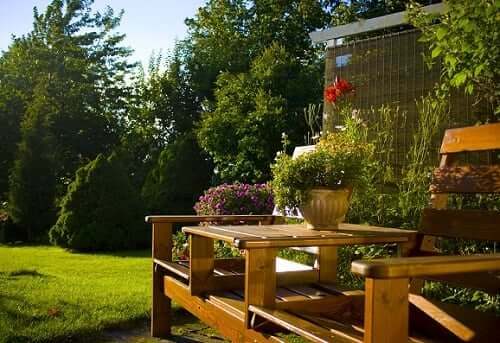 This area should be well maintained, clear and uncluttered, as it connects all the other areas of your garden. It represents unity, harmony, and balance. Boulders, rocks or stone statue can be placed in the center. You can create stone pavement over here too. If the hard surface of the rock seems too much, it can be balanced out with soft grass – a perfect balance of yin and yang. When applying Feng Shui practices to your backyard and your home, make sure that all the energy also feels right for you – avoid plants or elements you feel repulsed by, or might be allergic to. Of course, the climate conditions are also crucial for choosing all the elements in the garden. The primary goal is to let the energy flow freely, increase your wellbeing and make you feel relaxed and balanced.